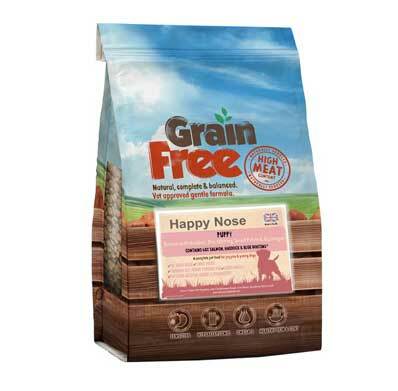 Happy Nose Grain Free diets are complete and balanced all our Grain Free products are made with freshly prepared high quality protein sources, which are proven to be more digestible as well as very tasty to your dog! 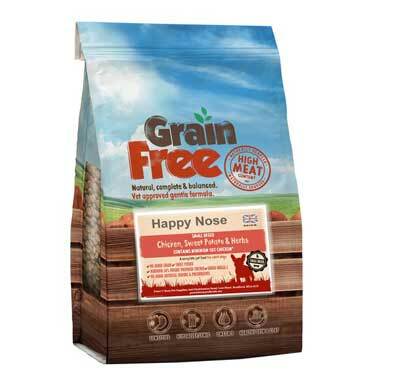 Probiotics within our Grain Free foods help support digestion and help product smaller, firmer stools so less poo for you to pick up! It also means that your dogs system is using all the quality ingredients and not just producing a lot of waste. Both meat and fish varieties are made using freshly prepared high quality meats and fish. 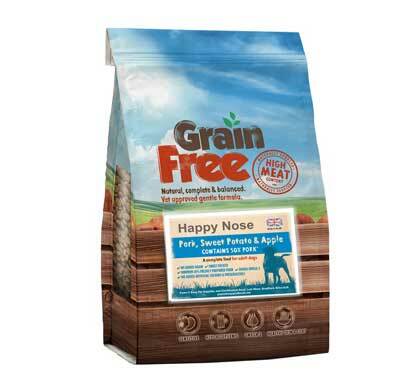 You will find our Adult Grain Free range has no less than 26 freshly prepared meat or fish in them. A unique cooking technology called “freshtrusion” is used to cook the meats at low temperature and low pressure, which means there, is a higher nutrient bio-availability when fed to your dog, which means more of a natural aroma and taste for an enjoyable nutritious and healthy meal time.